Costco Fundraising Continues for the month of May! Costco’s Fundraising Campaign for Kapi‘olani continues this May, for their month of Miracles! At the Waipio Costco the campaign is really visual with photos of hospitalized kids at Kapi‘olani at every register. The Waipio team is proudly asking Costco customers to donate to the Children’s Miracle Network and the responses are overwhelmingly “YES!” You can see how successful their efforts are because there are so many CMN balloons all over the store representing all of the donations that are coming in. For every dollar donated, people are posting balloons with their name on it or the name of a baby they know who was born at Kapi‘olani. 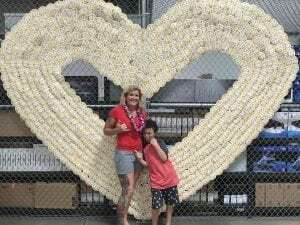 From the giant heart made up of balloons to the sign that reads “Mahalo”, there is a spirited showing of how much people care for our keiki at Waipio Costco!